A Ukrainian Celebration of New Life in Christ Children love coloring Easter eggs,and here's a story to explain one of the origins of this tradition. 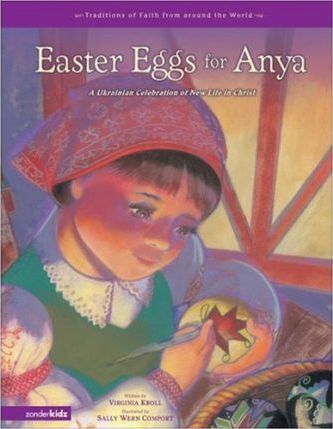 In early nineteenth-century Ukraine, Christians celebrated Easter by exchanging colorful, hand-decorated pysanky eggs---but with Papa away at the war and Mama struggling to make endsmeet, Anya's family was too poor to buy eggs to decorate one year. That is, until Anya discovered an abandoned nest of goose eggs and began planning an Easter surprise forher family. But God had an even better surprise in store, and when the eggs unexpectedly began to hatch, Anya learned what the Easter story teaches:spring brings gifts of myriad new beginnings, just as the risen Christ gave the gift of new life to us all. Each Traditions of Faith book features a story of how significant Christian traditions emerged in cultures around the world, with a note about the origin and history of the tradition, and offers ideas and activities each family can adopt as its own.